A few months ago while i was cleaning out my closet i discovered some really old wallpaper borders, they had to be at least 5 years old... Anyhow I saved the wallpapers, thinking i would reuse it some how. And so i did! There was a beautiful floral print wallpaper border. Instead of using the wallpaper as is, I decided to cut out pieces and arrange them just above my mirror as if it was a decal. This is what i came up with. 2. Arrange the pieces you've cut out. 3. Once you've decided on a pattern, begin brushing mod podge on to the back of each piece and placing each one on to the wall. Once all the pieces are on the wall let it dry for 30 minutes. 4. 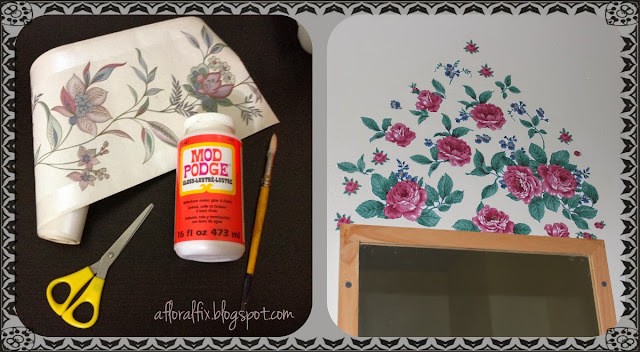 Apply another coat of mod podge on each piece. Let it dry.